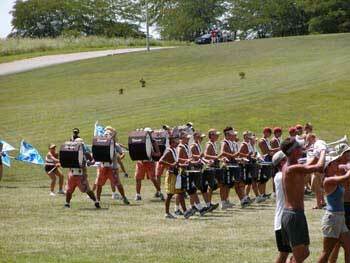 Here's the push before the last company front of the 2002 Boston Crusaders' show. This picture was taken during the corps' final run-through in Berneveld High School. View the Forzato archives We're running low on Forzato pics! E-mail your submissions -- and we will get to them all, in time -- to dave@dci.org along with where and when the photo was taken. Send some biographical information about yourself as well. We'll give you full credit. Also, let us know if you want your e-mail address included, to get feedback from other drum corps fans.